Released in 1959; reissued in 1961 with revised Chipmunk character designs. Producer/Voice Artist: Ross Bagdasarian. Engineer: Ted Keep. Special Film Editors: Byron Chudnow, George Brand. Cover Design: Pate, Francis and Associates. Running Time: 24 minutes. Songs: “Chipmunk Fun,” “Alvin’s Harmonica,” “The Chipmunk Song” by Ross Bagdasarian; “Whistle While You Work” by Frank Churchill, Larry Morey; “Ragtime Cowboy Joe” by Maurice Abrahams, Lewis F. Muir; “Yankee Doodle,” The Little Dog,” “Old Mac Donald Cha Cha Cha,” “Three Blind (Folded) Mice,” “Good Morning Song,” “If You Love Me (Alouette),” “Pop Goes the Weasel,” (Traditional with Arrangements and Special Lyrics by Ross Bagdasarian). The explosive success of 1958’s “The Chipmunk Song,” the best-selling novelty record of its time and still a holiday standard, inevitably led to an album. 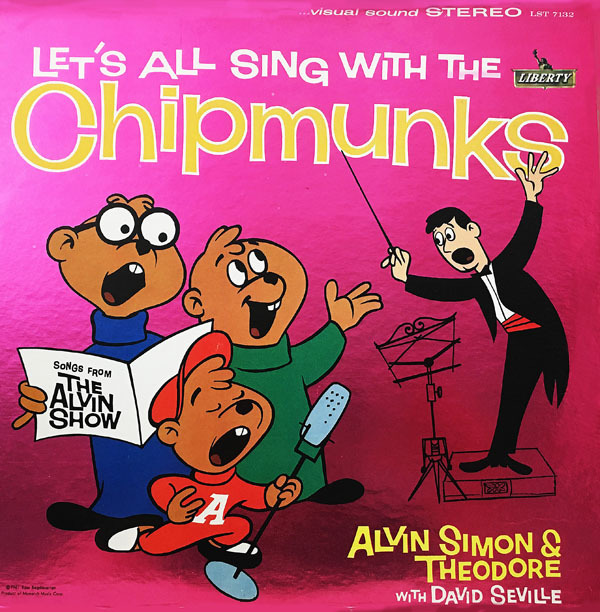 Released the following year, Let’s All Sing With The Chipmunks included not only that #1 hit but two other 1959 singles, “Alvin’s Harmonica” (which reached #3 on the charts) and “Ragtime Cowboy Joe” (peaking at #16). This was one special release indeed. 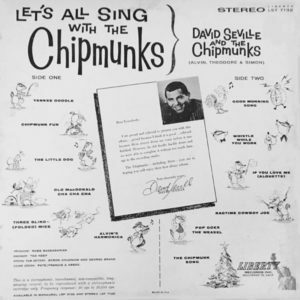 As David Seville and all three Chipmunks, Ross Bagdasarian made appearances on such TV shows as Ed Sullivan with three Chipmunk puppets resembling the animal-like creatures pictured on the 1959 album cover. The approach was somewhat juvenile but could arguably appeal to adult fans of novelty records. 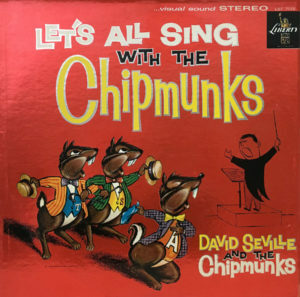 Overall though, it is a children’s record containing a classic Disney tune and several public domain songs that often fall into the category of “nursery” or “Mother Goose.” There’s one big difference at work here, however, and it sets the pattern for all future Chipmunk projects: an edge. It’s among the elements of Bagdasarian’s peculiar genius in combining a very simple technique of merely speeding up three voices with a lead voice. One is giving each a distinct personality: you can read whatever you want into that—the id, the ego, the superego, or the Kirk, Spock and McCoy. Two is the wonderful silliness of these voices in the setting of the songs themselves, especially when the songs are popular or iconic. The third is the rebellious nature of Alvin, which varies from throwing a note to blowing the budget. Dave can be mildly irritated or driven to madness. Even a first-time listener can get the premise immediately within two minutes. 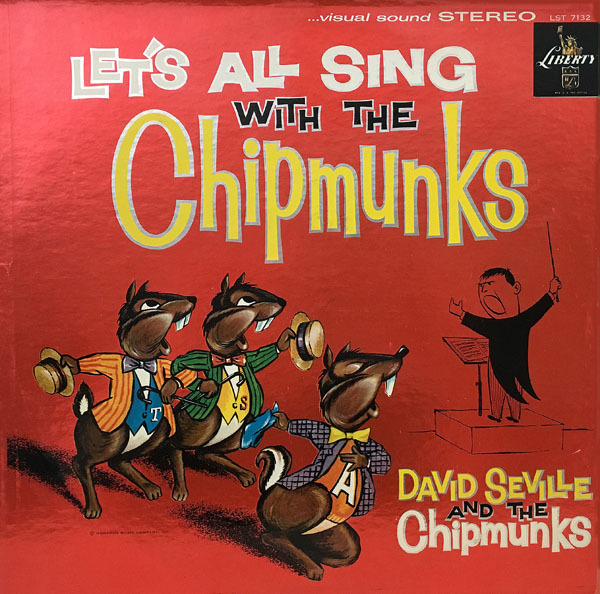 Let’s All Sing With the Chipmunks was released during the “hi-fi” stereo craze, so even though it was available for play on mono equipment, listening to it with stereo speakers was as close to a Disneyland attraction at home as kids could get in the late ’50/early ’60s. Alvin rode a horse across the room! The “old MacDonald’s come from the left side and the “cha-cha-cha’s” came from the right! You could even take Dave’s directions and sing the missing words to be part of the whole thing. Take that, futuristic interactive digital stuff! Both the 1959 and 1961 covers (redesigned with the Alvin Show character images) were released with nifty foil surfaces. Even though it took special care to keep these looking good, they were very attractive. Later non-foil releases had pink backgrounds. Some CDs used the foil look, too. A nice little song with a melody similar to “Happy Birthday” that gets very little notice in the midst of so many other Chipmunk treasures. I had that first version of the album…still do. I also had a Dell comic based on that version of the Chipmunks before the cartoon was released…that I no longer have. I remember a pre-Alvin Show LP from early 60s childhood. A distinguishing feature was translucent color vinyl, something I never saw again. Even as a kid, wondered about the TV chipmunks: 1. being that big, 2. wearing turtlenecks and shoes, but possibly no pants, and 3. not only being treated as human children, but occasionally chasing girls (decades later, Robot Chicken “went there” as young rock star Alvin found out about groupies). Even more intriguing was Clyde Crashcup, struggling to invent stuff that already existed (music, westerns, chairs) with a very cool magic pencil. Did Crashcup exist in a world where all this stuff didn’t exist, or was he just really out of touch? OMG – I’m 57 years old and I STILL love the Chipmunks! I love how the musical arrangements got more complex and “richer” as time went on. My absolute favorites are “Me Too (Ho Ho Ha Ha)”, “Tonight You Belong To Me”, and “Mississippi Mud” (shades of Sy Zentner), all from the album “The Chipmunks Sing With Children”. I also love many of theoriginal songs that were written by Ross, such as “Sing A Goofy Song” and others, many of which were from “The Alvin Show” and never released on any albums or singles. Speaking of “The Alvin Show”, Disney owns it and only ever released portions of it on “Disney Sing Along” vhs tapes, with ‘enhanced’ music ( drums and electronic instruments added tothe original tracks ). Its positively criminal that the original “Alvin Show” has not been restored and released. Ready here we go, its the Alllvinnn Shoooow!!! Me,too, Greg…I only like the 1961-62 ALVIN SHOW and NO REMAKES!!!! Although its billed as “The very first Alvin Show” its just an amalgam of bits from different episodes that somehow were omitted from the Disney ownership, and the rights either reverted to the Bagdasarians or went public domain, much in the way that certain Three Stooges movies, Twilight Zone episodes, Beverly Hillbillies episodes, etc. Became public. Fun Fact: When the 1963 movie “Charade” was issued by Universal the copyright notice didn’t include the word “Copyright”, “Copr.” or the c in a circle symbol, so the movie became public domain immediately upon its release, although the MUSIC remains under copyright. Gregory, I have yet to see any verified sources saying that Disney owns “The Alvin Show”. Could you please provide a source for this information? The Chipmunks franchise itself is owned by the Bagdasarians, and as far as I know has never been affiliated with Disney… so I can’t for the life of me imagine WHY the Walt Disney Company would own this specific cartoon series from the franchise. As we can see near the bottom, the distribution company for this tape is Buena Vista Home Video – Disney’s home video department. But take a look further down. Underneath the “Distributed by Buena Vista Home Video” part, it says: “© Bagdasarian Productions. The Chipmunks is a registered trademark of Bagdasarian Productions.” Please note also the drawn “BAGDASARIAN PRODUCTIONS” logo to the left of the text info. The ownership is clear. The thing is: just the fact that Buena Vista distributed something on home video does NOT necessarily mean that the Walt Disney Company owns it. Buena Vista released lots of stuff on VHS which Disney itself didn’t own – they’re a *distribution* company, after all; and in the business to make money. Just take a look at all the VHS and Betamax releases of theirs which have so far been listed at VHSCollector: http://vhscollector.com/distributor-gallery/1981 There is TONS of stuff there that Disney never owned — Buena Vista simply licensed it for home video distribution. In other words, I’m concluding that you’re wrong. Disney has never owned “The Alvin Show”. They only held (for a brief while in the 90s) some home video distribution rights to it. And even those home video releases were clearly done by arrangement with Bagdasarian Productions, as can be evidenced from the VHS cover I described above. I don’t know why the DVD/Blu-ray release labeled as “The Very First Alvin Show” is actually a mix of different episodes (I had heard of that before); but whatever the reason, it has nothing to do with Disney. All of the Chipmunks characters, cartoons, images, song compositions and arrangements are owned by Bagdasarian Productions. Where it might become complicated is with the actual recordings themselves. They may be the property of EMI, which releases them, or Capitol Records, or Universal Music, or whomever the recording license belongs to. That may be why The Alvin Show has been so hard to release on DVD and Blu-ray. TV shows with musical numbers, like variety shows, can be very expensive to release on home video because of music licenses and things like that, beyond paying for the shows themselves. Maybe they released the first Alvin Show to test the waters, to see if it would sell enough to justify releasing more episodes, and it didn’t. This is just conjecture. Disney does not own the Chipmunks, they just made the VHS tapes, along with Rocky and Bullwinkle tapes as well, several years ago. Well, when I’m wrong, I’m wrong – you’ve convinced me. I guess its exactly the same thing that held up WKRP, Happy Days, and the old variety shows like The Smothers Brothers – the music rights! 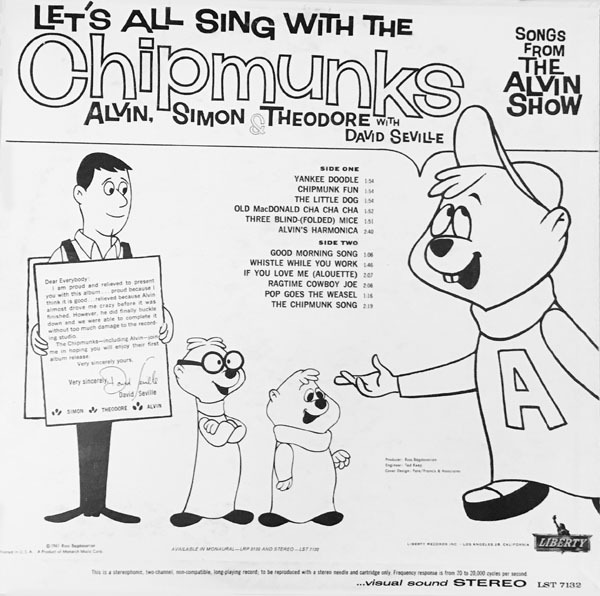 The Chipmunks were named after Simon Waronker, Theodore Keep, and Alvin Bennett, three executives at Liberty Records. I should mention that the puppets for “The Ed Sullivan Show” appearance were done by Bob Clampett Productions. 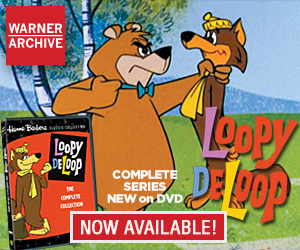 While Liberty sold and bought the tapes, Ross Sr. retained merchandising rights to the Chipmunk characters themselves; and this created some sort of loophole Ross Jr. has since exploited, by which Capitol/EMI or their successors own the tapes, but cannot license them to anyone for any use without Ross Jr. and his company’s participation. I believe the “flash point” on this was some years ago when Capitol licensed the use of the “Chipmunk Song” track to a company marketing a novelty ballpoint pen that would play the song from a… uh, chip. As for me, I’d like to see a CD box set of Ross Sr.’s NON-Chipmunk tracks, which contain some fine instrumentals and “straight” vocals… and I’d bet he recorded a lot of good stuff that never got released. A story, as one can see from grinding through these brief comments, needs to be told properly. Has a legitimate non-Chipmunk version of Witch Doctor been released outside of the original 45? The first release of The Chipmunk Song, only on 45,was recorded only in mono. Right? The story goes that it had to be rerecorded in stereo when the LP came out. Where can one find the original mono mix of TCS outside of the original(first year release) 45? As mono was phased out in 1968, the stereo version is basically the only one I’ve seen on the many compilations,both Chipmunk and various artist Christmas comps. There was a second version of The Christmas Song 45 which replaced the original.The original b-side, the instrumental Almost Good, was replaced with a Chipmunk track, Alvin’s Harmonica. There was a picture sleeve with rodent artwork released for the reissue. There is no picture sleeve for TCS/Almost Good. It has been noted that even Alvin’s Harmonica is different in mono than on the stereo LP. A note about the red vinyl used on Let’s Sing. I’ve never seen a red vinyl version in stereo. Colored vinyl wasn’t used a lot, but it was there, and not just on kiddie records. Fantasy and Bethlehem, two jazz-centric labels, were often pressed on color vinyl. Bel Canto, an audiophile label, pressed on color, including swirled multi-color. Si Zentner, who was also a labelmate of Bagdasarian on Liberty, had titles on Bel Canto. Zentner would work on The 1961 Alvin Show. The title theme has Zentner’s brassy touch, as well as the Johnny Mann Singers, another Liberty act. No, it was recorded on multitrack either tape, or 35mm film, it depends on who you ask (it had to be!) The track had a stereo 45 release a year later after it’s original release but copies are so elusive no one knows if it’s true stereo or not. For sure it was only in fake stereo since it’s inclusion on the first LP in1959 and on every subsequent “stereo” issue of the song until the early to mid 1980’s when the original session tapes were dug up and remixed a few times for stereo. Those remixes are easily found on various Christmas compilations. What bugs me is people say the original 45 was a different version, yet I’ve owned a first pressing of that 45 and it’s identical to every version I’ve ever heard. Even youtube has nothing but the same version across various postings of it being played on all sorts of 45’s and even a British 78 of the song!